That means you’ll be taking time Saturday night or Sunday morning to adjust your clocks up one hour. While you’re going room to room to update clocks, could we recommend you spring into action for a check of your smoke alarms and carbon monoxide detectors? Preventative steps, like hiring a CSIA Certified Chimney Sweep for an annual inspection of your chimney and fireplace, make your home safer. Still, the potential for a fire or carbon monoxide intrusion in your home is always present, and alarms or detectors could be the only thing standing between your family and tragedy. 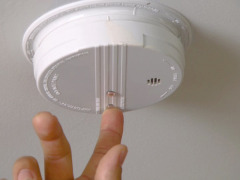 If you aren’t convinced that a check of your systems is worth the extra couple of minutes this weekend, consider this: Having a working smoke alarm cuts the chances of dying in a reported fire in half, according to the National Fire Protection Association. It’s not by accident that we quoted the NFPA above, because its website is a great source of information about smoke alarms, including a breakdown of how ionization smoke detectors work differently from the photoelectric type. When it comes to carbon monoxide detection, the nation’s fire departments respond to nearly 100,000 non-fire CO incidents each year. That’s more than 250 cases of carbon monoxide intrusion reported every day nationwide, according to the NFPA. Help reduce your family’s chances for tragedy this weekend. When your clocks spring forward, you should spring into action and check your home smoke alarms and CO detectors.